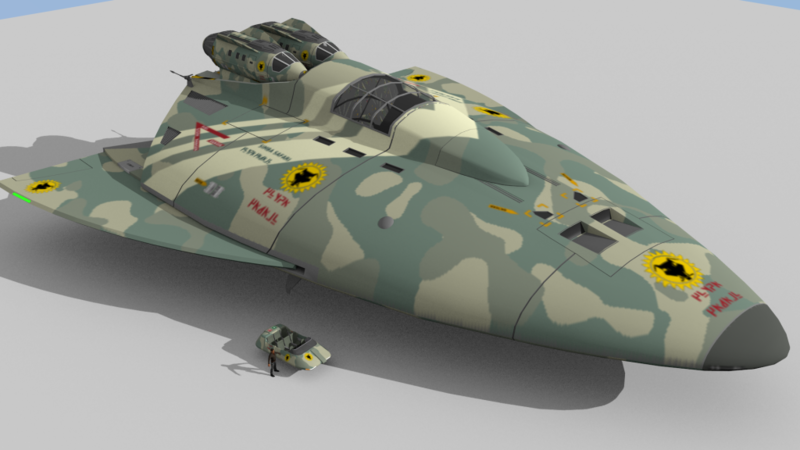 The Simba Safari is one of the Safari 234 Class built by KZM Industries on Warlock (Ley – 0529). It has numerous special features designed for the Out Hunter. 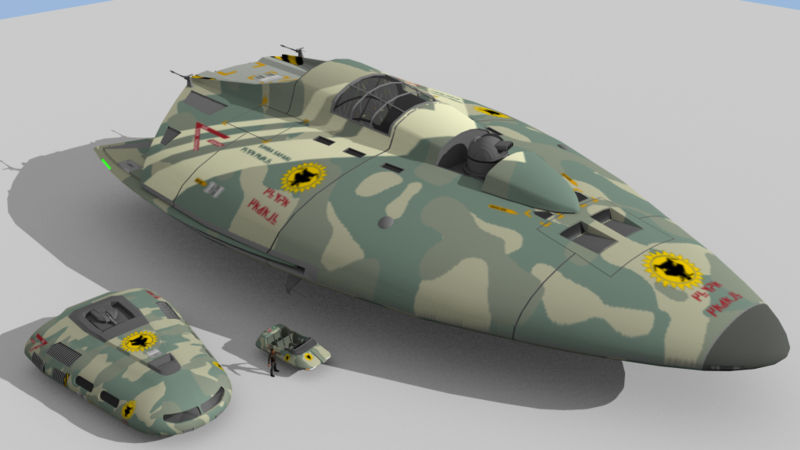 The hull form is a wedge shaped, streamlined, lifting body, easily maneuverable in an atmosphere. The Safari Class is designed for landings in rough terrain with specially strengthened support gear. 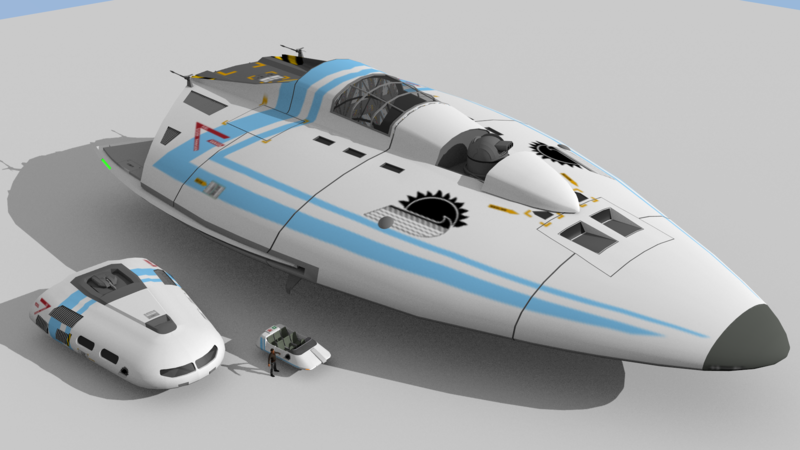 Capable of 1 G accelleration and Jump 2, this vessel is fitted with fuel scoops and a purification plant for it’s 50 tons of fuel. The bridge is eqipped with control stations for four; pilot, navigator, engineer, and gunner. The computer installed is a Model/1 bis with standard software package. A double turret is installed on the single hardpoint, mounting a SandCaster and a Beam Laser. 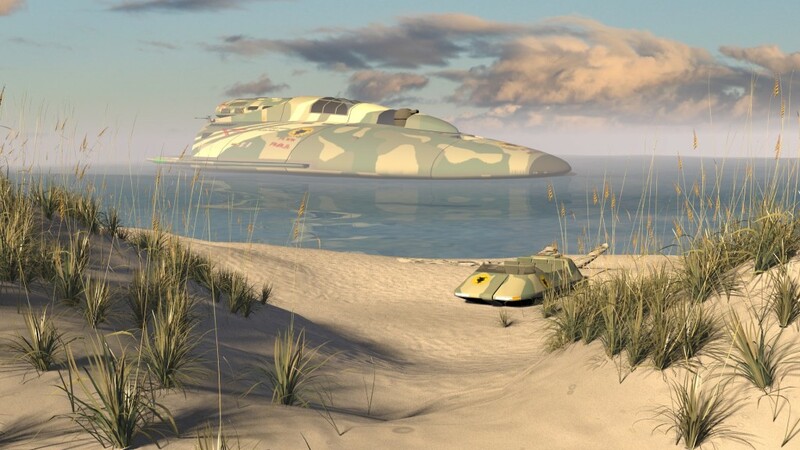 Auxiliary vehicles comprise an internally stowed 4-ton air/raft and a dorsally mounted 20ton Launch/Lifeboat. Two tons are reserwed for cargo, with special cages fitted to hold 10 and 13 tons respectively. Interior fittings are of high quality, and the living quarters are especially luxurious. The first ship of it’s Class carries the name „Starflame Safari“, others carry the name of memorable adventures/ safaris/ journeys: e.g. Rubesa Patrol, Nebula Rover, Dawn Trek, Rimward Run, Wilderness Wanderer, or like this vessel Simba Safari. 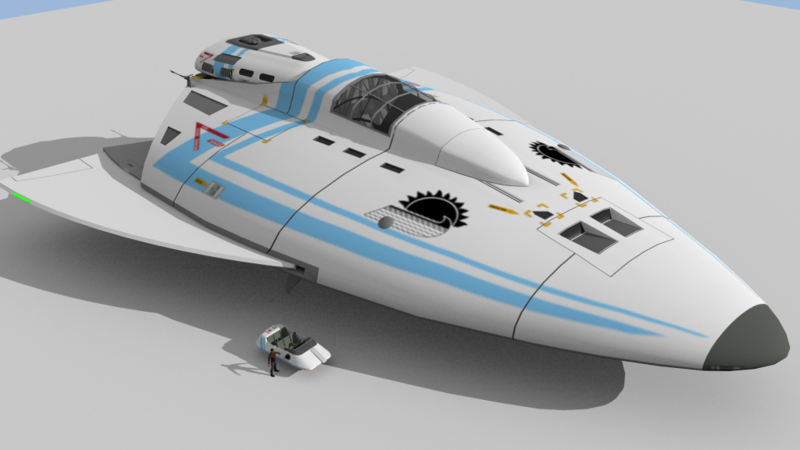 My self declared mission is to model all the iconic CT starships. Of course I want to portray a few that haven’t been covered by other artists in much detail before, such as this little beauty. The Safari 234 Class 200dt Judges Guild Safari Ship was featured in the supplement Simba Safari published by Judges Guild and now re-published in PDF form by GDW aka Far Future Enterprises on DriveThruRPG.com. 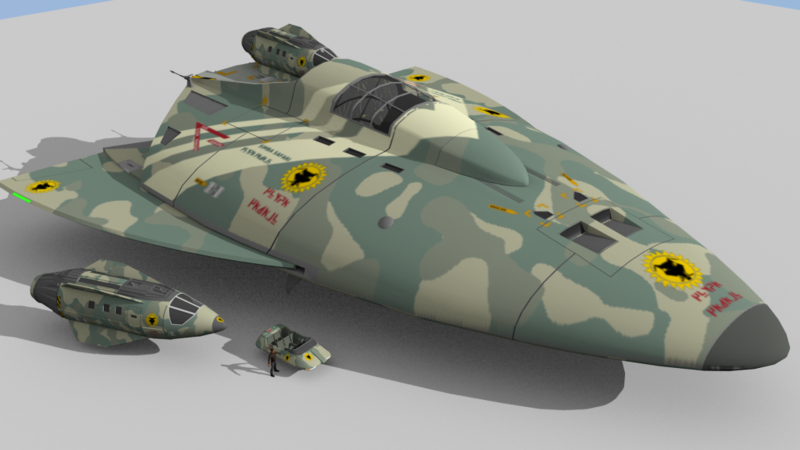 The image shows the ship with extracted wings and closed pop.up turret. 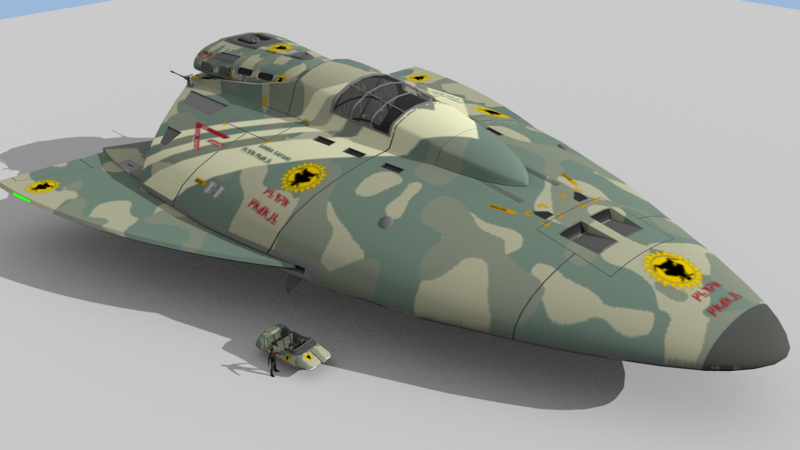 The image shows the ship with the pop-up turret deployed and wings retracted. Furthermore the deckplans clearly show an emergency Airlock between the rear thrusters (again accessed through engineering) but no other means to access the craft except for a floor hatch on the bridge (another no-go in my book) and through the launch. 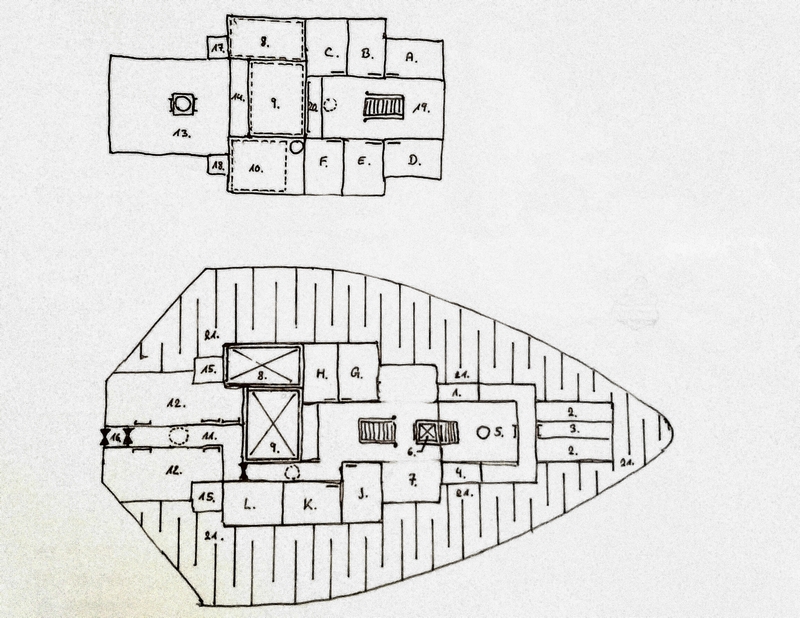 So either I need to re-design the deckplan to fit the description or re-design the visual appearance of the ship to match the deckplans. 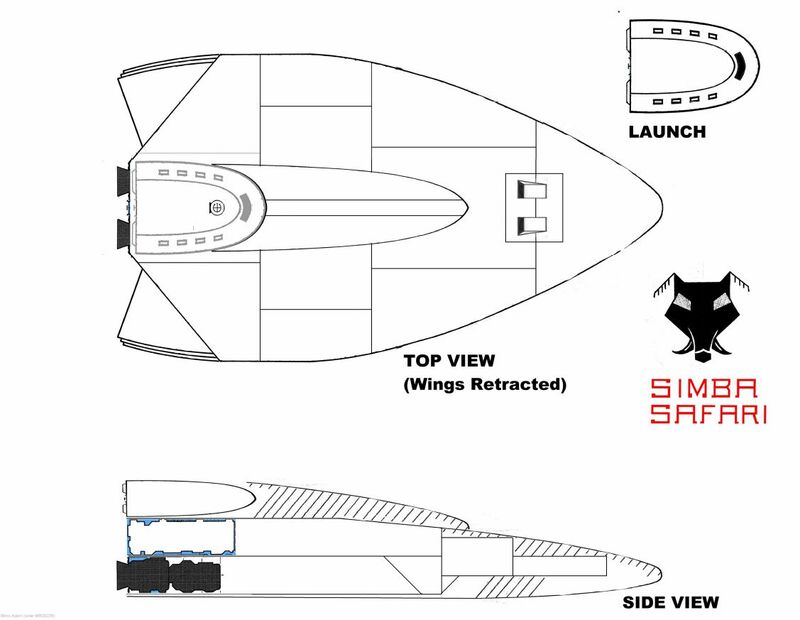 The air/raft is mentioned to be carried inside the ship, but no indication of this can be found on the deck plan (which completely omits the dorsal aerodynamic cowl (which could easily house it – so that will be my assumption). I think another Deckplan is due and I will focus on that and base it on the scan below and my 3D model. My design philosophy in a nutshell: Strict separation of operations, cargobay and crew or passenger areas. There should be a way to get into and out of the craft and launch without using any of the operational areas (engineering, bridge, avionic, computer, life support or cargobay). Access to turrets only through crew areas. Passengers want viewports, so each cabin and the lounge should have some. Access should be easy when grounded, a ramp or telescopic lift should do the trick. As the ship features split drives anyway these will be moved a bit further apart to allow for a corridor on the lower deck connecting the lounge and the ventral launch access hatch. This inturn will ascent through the upper engineering to the hatch. A secured set of hatches allows access to this part of engineering too. The connecting stairs between lower and upper lounge will be moved to the rear, so a telescope lift can be fitted to access the ship from below when grounded. The lift opens both to the front and rear, so it can function as a security airlock towards the bridge during flight. Furthermore the lift now helps to access the bridge as there is a level change which is shown as being overcome by some stairs. I haven’t decided on the final configuration. The cargo bays in the rear part of both decks do not need to be re-arranged so the two deck high bays are located at the port side and the centerline, with the latter being a marine tank (possibly with a panorama glass wall forming an aquarium visible from the upper lounge’s bar „mirror“. The starbord bay is used to carry the air/raft. All bays feature overhead hatches for easy loading, cleaning or getting rid of especially nasty specimens. The dry bays feature a ventral cargo lifting platform (in fact the entire cargo bay floor can be lowerd to the ground) for easy loading or unloading. The cowl houses the launch dock at the rear, loading hatches for the marine tank, a glass canopy for the lounge and a turret. I hope to be able to fit the air/raft into it too, but that remains to be seen. The cargo bays are somewhat special. Bay One is normally used as a Specimen Cage and features a dual layered floor that is mounted on telescopic riders running in rails through the whole height of the hull. This allows for both floors to be lowered or raised out of the ship for easy loading or unloading from above or below the vessel depending on port or wilderness situation. Also it allows for a variable height of the cargo bay, as the upper floor can be lowered onto the lower floor so the bay can reach a height of two decks (6m). Bay two features a similar floor configuration but can only be lowered beneath the ship. As this bay is equipped as a marine tank, it can be loaded while being watered or submerged. Both bays feature collapsible cage elements to secure both bays either in half height or full height configuration against forcefull specimen. The marine tank is also equipped to find use as an on-board swimming pool, diving bay and of course as a cargo bay. Bay three only features an overhead hatch with telescoping floor to be raised above the hull. As it is used to store the air/raft, this allows for easy take off and landing. I will model the mechanism to illustrate it’s use. I scanned the reference image from the supplement as per FFEs Fair Use Policy. If you want to see the deck plans, go grab it at DTRPG, at less than five bucks the book is a bargain in my opinion. There is a variant featuring two of the JG 10dt Life Boats, which I also plan to model. Scan from JG Simba Safari supplement.